Very disappointing from Ms Haigh. An earlier paper from her expressed the opinion that the sign of the solar effect on part or parts of the atmosphere might need to be revised and on the strength of that I sent her a copy of my earlier article explaining how and why that could well be so. Her reply seemed open minded and broadly supportive so to now hear her go to such lengths to emphasise the GHG theory and downplay solar influence is a great surprise. Good catch … at silly mid-off! If the sun is at full power, then we better wrap up warm when it drops back. HADCRUT numbers are out and down 0.25C in December. @ SW 2:23pm – it shouldn’t be a surprise, the orthodoxy has to be defended by those on its payroll. I read the Fox piece. Donna should take a bow. Agreed Phil, Donna is very sharp and stays on the point. Suspend your cognitive dissonance for a moment folks and have a peep beyond your own back yards. It’s a little warm out here. I wouldn’t be surprised if this letter from Haigh is one of her desktop icons because she’s clicking and sending it out elsewhere, probably all over the net, spreading the truth-but-not-the-whole-truth to infect the minds of ordinary intelligent people who rely on the integrity of such experts. We asked some climate scientists for their thoughts on the piece, and this argument in particular. “I’m delighted that the mayor maintains his interest in weather and climate but he should be wary of drawing generalised conclusions from his observations. He suggests that the cold weather in London is due to declining solar activity – but actually the Sun is more active now than it has been since 2009, and about the same as it was in 2004 and 1998. “On longer timescales – decades to century – the sun may be very slowly declining in activity but this can’t explain year-to-year variations in UK winter weather. The mayor makes an interesting point about the weather during the Maunder Minimum in sunspots and, although the cooler weather then was largely confined to north-west Europe, that may quite likely have been influenced by the Sun. But at that time solar energetic output was considerably lower than it is today. The solar particles are not mysterious, they are ions which 1. become trapped in the oppositely rotating Van Allen Belts, 2. flow in and out of the poles of the earth during Flux Transfer Events, and 3. which happen to cause tremendous electrical currents in the crust of the earth during CMEs. The measurements and observations of the Van Allen Belts and the way these couple the space weather from the sun with the weather systems of the earth are still being investigated by twin NASA probes, which do not even have names. I don’t think it is necessary to “invoke” any “mysterious” particles either. “Investigate” the electrical nature of “flowing charged particles” and their effect on the Van Allen Belts is what is necessary at this point, and the way forward. @ Zeke: have you seen this from Miles Mathis re the South Atlantic anomaly? Certainly an interesting theory. Looks like the Met Office is wasting its money trying to recruit a space weather specialist then. It is worrying to see such a misleading letter from Joanna Haigh, Professor at Imperial College. 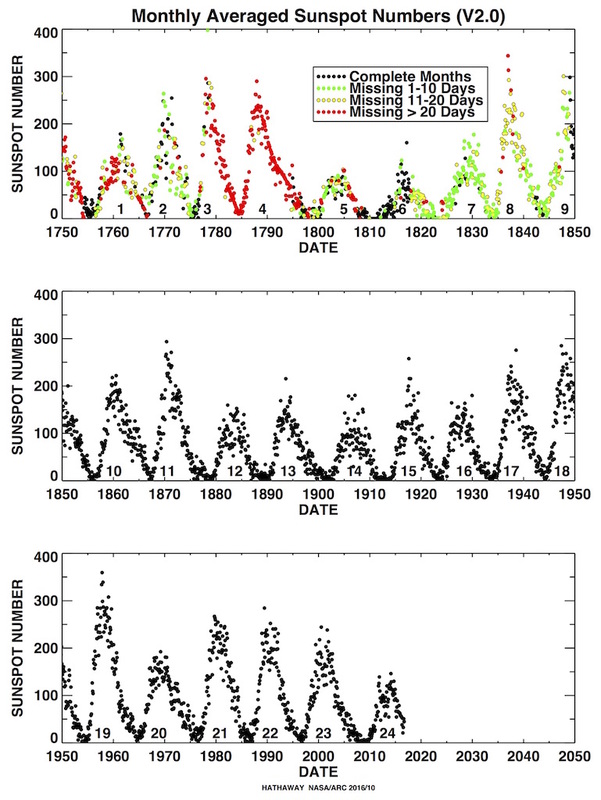 It is quite clear that solar activity has decreased in recent years. Whether or not this influences the Earth’s climate is very poorly understood and an important topic for future research. Defend yourself! Or are all the skeptics right? Let’s help Joanna out with some further info on the ‘Mysterious solar particles’ she’s clearly so ignorant of. “Kinetic processes prevail in the solar corona and solar wind. Since the plasma is tenuous, multi-component, non-uniform, and mostly not at LTE (Local Thermodynamic Equilibrium) or collisional equilibrium conditions, multi-fluid theories or kinetic physics are required for an adequate description of many coronal and solar wind phenomena. The coronal plasma is stratified and turbulent, and strongly driven by the underlying photospheric magnetoconvection, which is continuously pushing around the magnetic field lines reaching out into the corona. Thus the field contains ample free energy for driving plasma macro- and micro-instabilities. Consequently, magnetohydrodynamic as well as kinetic plasma waves and associated wave-particle interactions are expected to play a major role. Certainly, Coulomb collisions also matter, which are kinetically described by the Fokker–Planck operator (see, e.g., Montgomery and Tidman, 1964). However, excitation, scattering and absorption of waves, either of fluid or kinetic type, will dominate over collision effects. The consequences for the velocity distribution function (VDFs) are often described by a quasilinear diffusion operator involving the wave spectra. The key problem then is to understand the transport properties of the weakly collisional corona (and solar wind), which requires consideration of multiple scales, spatial non-uniformity and most likely also temporal variability. No invocation necessary Joanna, we have science these days. it’s all those global warming flakes that have been dropping out of the sky, that’s what has done it. Well, that’s quite an admission, I bet that’ll earn her a rebuke from the galactic gatekeeper when he hears about it. Yes, pretty disgraceful and deliberately misleading. What was Hickman saying about taking climate science seriously? If we don’t take their “science” seriously we won’t need a referendum to know whos fault it will be. I suppose solar particles may seem mysterious …. to a climate scientist like Haigh. For the rest of us who did first year physics they are fairly mundane objects. TB Piers references this post and will appear on BBC Sunday. Presume he will be edited and made to look a loon. Hope he did a JoNova and recorded it just in case. The clear-sky atmospheric greenhouse factor, the energy supposedly creating the GHE, is defined as G=S-OLR where S is the S-B emission from the Earth’s surface, 396 W/m^2 for 16 °C and OLR is the outgoing long wave radiation at top of atmosphere= 238.5 W/m^2. with 160 W/m^2 leaving as convection, radiation and evapo-transpiration. Ramanathan believes that about the same energy as that which reaches the surface from the Sun is magically created within the atmosphere by arbitrarily assigning to a temperature signal the properties of a real energy flux. This is a failure to understand the most basic principles of physics. The proof is very simple. By claiming in AR4 that 1.6 W/m^2 AGW is critical, an energy accumulation 100 times greater means we should be all dead. The real energy absorbed is 23 W/m^2. They might argue that it all stored as latent heat but that would appear as an increase in OLR. What’s worse is that in the modelling they add another 238.5 W/m^2 DOWN from TOA to match the two-stream approximation. Do the sums and this means the energy accumulation is exaggerated 12.74 rimes. What we are viewing is a complete and utter perversion of the principles of science; its conversion to a religion which at its heart is a wilful aim to breach the principle of conservation of energy, the 1st Law of thermodynamics, and to breach the 2nd law, which is the use of the heat energy in the lower atmosphere to cause itself to expand. These are absolute criticisms. There is no way out for these charlatans. If water vapor levels are cyclical and start rising again, global temperatures will also rise in a hurry and we doubters will look rather silly. 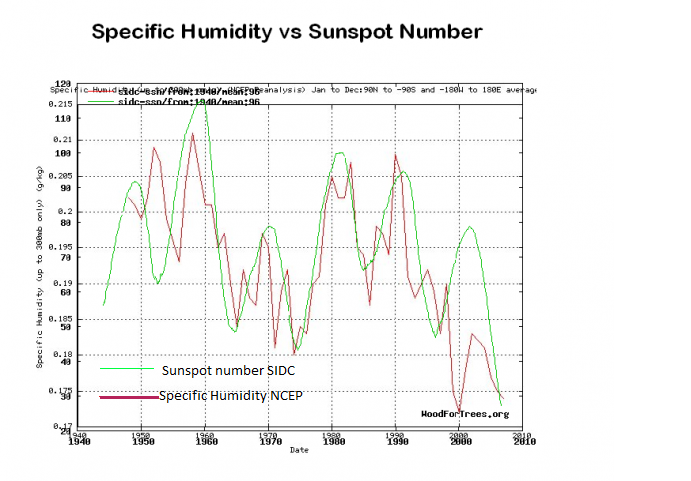 Nuclear physicist Clive Best talks about a 60-year climate cycle on his blog and water vapor could very well be the underlying mechanism. More cloud by day and less cloud by night may also have offset the warming. The greenhouse effect is not just a laboratory trick that works fine in a bell-jar but flops in the real atmosphere. American, European and Japanese satellites have all measured Earth’s outgoing radiation and the results are exactly in line with the predictions of the greenhouse theory. Precisely because Al Gore is wrong and the science is not settled, only time will tell if the alarmists or the skeptics are right. In the meantime, everyone who doesn’t understand how greenhouse gases work should spend some time at scienceofdoom.com. Despite the “alarming” name this page takes no sides in the climate debate. It’s all about the physics of climate science, and it gets pretty technical, so go prepared. If you want to beat the alarmists you’re going to have to be at least as well informed as them. We are at the peak of the sixty year cycle around now, so I doubt we’ll see much in the way of extra warmth and water vapour over the next thirty years from the AMO or PDO, just the reverse in fact. 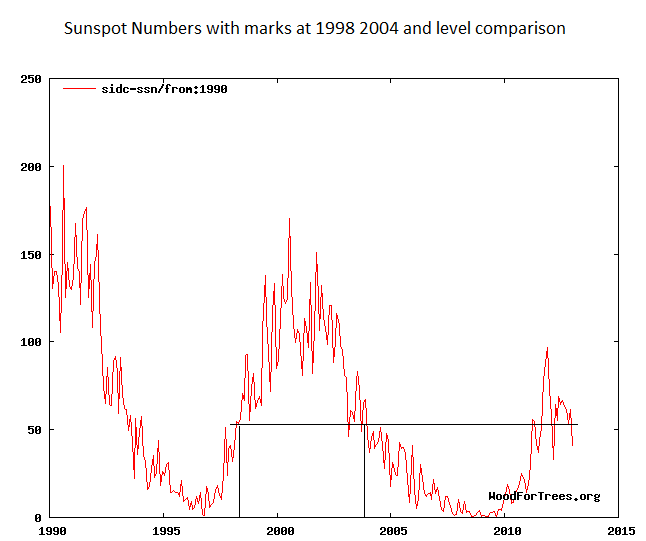 The error on OLR measurement is around +/-4W/m^2 which makes it around 5 times the supposed signal from increased co2. The running mean has been rising, not falling, while stratospheric temp has been steady since 1995 according to the MET office and NOAA processing of the radiosonde data (though there’s a nearly 2C disagreement between them). So I’ll have to disagree with your assertion that “the results are exactly in line with the predictions of the greenhouse theory”. I see Piers Corbyn has given us a mention here, and that he is on BBC1 at 12.05 on the London Politics show to discuss Boris and Joanna’s views. Word is he might mention us there too. It’s on the BBC I-Player here – starts at 51m.30s. (time can be selected on the bar), runs about 9 minutes. Piers Corbyn is featured in his office at the start, only a short piece, then the rest is a studio discussion including Boris Johnson’s spokesperson ducking and weaving round the issues. This Tallbloke blog post is mentioned here. Unfortunately she misquotes Abdussamatov as saying another Little Ice Age is due to start in 2013/14, when his own paper quotes 2055 +/- 11 years. He only expects cooling to start by 2014. Haigh getting facts wrong Oldbrew? Shirley Knot…. Too bad the permanent GHCN temperature records have been permanently “adjusted” upward ~0.7 °C over the last three decades and will never return… permanently raised to “prove” AGW warming is here. About +0.4 °C was real, I admit and glad it occurred, as we recovered from the “oh, no, we are entering a new mini-ice-age” scare of the 70’s but that is about all I will ever see as being real. Like Anthony said long ago, ‘It’s the Sun, Stupid!’ though WUWT is now taking on an AGW tinge in it’s never ending advertising of the AGW propaganda. So far, her silence has been deafening! Despite my upbringing here in the “colonies”, I consider myself to be a reasonably intelligent, educated, and rational person. I have a B.S. degree in Industrial Engineering (admittedly from a university in the colonies). Please explain to me why is was that from ca. 110,000 years ago to ca. 10,000 years ago a vast glacier covered most of North America as far south as Long Island, NY (which island, as well as Cape Cod and a lot of Plum Island in Massachusetts) were terminal moraines of said glacier. In fact, where I presently reside (New England) is riddled with other glacial remnants e.g. massive glacial “erratics” all over the land and many miles out in the ocean, “kettle holes” and drumlins. For reasons unknown to science, at least when I studied geology, the planet “caught a fever” ca. 12,000 years ago, and most of that glacier had receded way back into Canada (where it can stay, as far as I’m concerned) by about 10,000 years ago. That is “settled science”, is it not? Now, was this last interglacial period started because of all of those cavemen back then were burning lots of coal and petroleum, driving big SUVs, and jetting all over the planet on Boeing 747s? Or perhaps it was due to all of my bog trotting Celtic ancestors burning too much “turf”? The top of Jeffreys Ledge in Ipswich Bay [Gulf of Maine] is ca. 20 miles out to sea and ca. 200 feet deep today. That was the sea level sometime during the last “ice age”, so I do believe, indeed, that the planet is warming and the oceans are rising, but I have yet to see any compelling evidence to concede that anything other than perhaps an infinitesimal amount of that rise is man made. Leo Hickman: Can we also have a referendum on whether to take climate science seriously or not?